Charabancs at Salisbury are a frequent theme. Photographers saw a golden opportunity to turn a profit since photographed passengers were likely to buy a print. We do not always know much about them and this one is just captioned 1923. 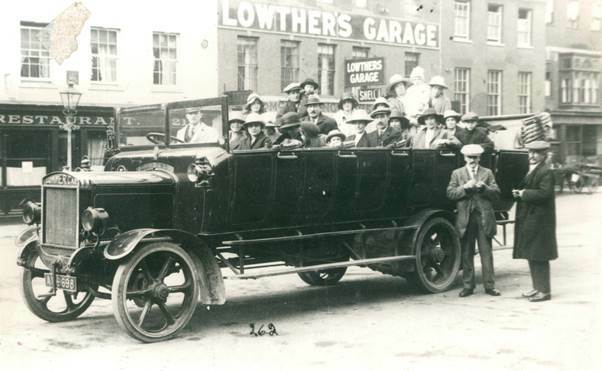 Because this formed a part of the Peggy Gye collection we assume it is a Market Lavington charabanc, probably belonging to Mr Sayer’s company. But we are not certain. We know the photographer was Whitworth of Salisbury – Harold Whitworth. But we don’t recognise the people on board so over to you. We quite hope there is enough detail there for the vehicle to be recognised as well. Just over a week ago we published a photo of the Royal Antediluvian Order of Buffalos in a charabanc on the edge of the Market Place in Market Lavington. It was captioned with the title given to this blog. As no year was given we cannot be sure whether this was another charabanc on the same outing or a different year. We suspect it was the same year. This photo is on High Street in Market Lavington just outside the Burgess’s shop. At the top left we can make out their ‘photographers and frame makers’ sign. This photo has a postcard back, but no publisher given. Hopefully one of the Burgess Brothers took it! It has a Burgess style of caption. Almost inevitably we do not recognise any people so once again we hope we can get some guidance on that. As usual in times past, a couple of householders have got into the photo! That’s the Co-op, which still exists, behind the back of the bus. The front page of this paper certainly lives up to its name. It advertises all sorts. But the big advert is for the Lavington and Devizes Motor Services Ltd. The trips out for the coming week are listed. There are three trips to Bournemouth at nine shillings (45p) return. It sounds laughably cheap but that nine shillings represents just about a day’s pay for a labouring man. If he had a wife and children we could be approaching close on a week’s wages for the transport to Bournemouth. You got a long day out for your money. The trip to Wembley was more expensive – but then it is a longer journey and that had a very early start from Lavington. The special for that week was Frome cheese show – then as now this was a popular event. In some cases it can be hard to identify old charabanc pictures. To most of us fairly uninitiated folks we can’t look at a 1920s bus and say what company it belonged to. And many of the photos were taken during ‘comfort’ breaks, often at Salisbury, where a photographer could take a photo on an outward run to the coast and have prints ready for sale on the return. But this one is actually in Market Lavington Market Place. A caption has been added more or less along the running plate of the coach. It says R.A.O.B. outing to Bournemouth. So we know where it was going and that the people on board were connected to the Royal Antediluvian Order of Buffaloes. Present day viewers would not recognise this as The Market Place for this is the area of the village which has seen most alterations and more than once. The rather fine house behind the coach was once a doctor’s house. At some point it was partially demolished and became a part of Fred Sayer’s bus garage. Behind the right hand end of this vehicle we can make out the top of Northbrook. The last of the pollarded trees was removed during the most recent renovation of the Market House. The charabanc looks to have solid wheels. They probably didn’t give a very comfortable ride but no doubt the passengers wouldn’t mind. They’d have been determined to enjoy that rare treat – a day by the sea. We don’t recognise the passengers but just in case anybody else does we’ll zoom in on them. Let’s start by looking at the back of a postcard for that has the caption. Bus enthusiasts will, as is so often the case, be disappointed that the photographer has concentrated on the people and not the front end of the vehicle. This photo was in a recently acquired envelope labelled F Sayers Photographs so we assume it is one of Fred Sayer’s buses with the hood down for an open air experience. This is the kind of conveyance we call a charabanc. The destination was clearly Weymouth. We think the photo was taken in Salisbury. We could comment on the size of a church choir over 90 years ago – and on the number of youngsters. This, of course, was pre almost anything that gets called entertainment these days. It was enjoyable to go and meet your mates at choir practice and then there was the almost amazing excitement of the treat – like this one to Weymouth. There’s a fair chance we won’t get any names here. Even the youngsters on the trip would now be over 100 years old (The baby on board would be about 94). But let’s take a closer look just in case. According to the records, the Lavington guides held a camp at Paignton in 1925 and 1926. This must have been an enormous adventure for the young ladies. The journey is more than 100 miles and probably took the best part of five hours in a heavily laden charabanc. Such journeys by road would have been way beyond the norm for people 90 years ago. No wonder the charabanc and its load was recorded photographically. We can’t identify the location but we do wonder if the charabanc was a part of the Fred Sayer fleet. We don’t seem to have a driver (who would surely have been a man) in sight. And not surprisingly we don’t recognise the guides who came from the wider Lavington area. The guides. Do you recognise any of them? The luggage is all stowed at the back of the vehicle. We would, of course, love to know more. This photo is a tad careworn but we have enough information to make it interesting. It dates from about 1930 and shows an all-male charabanc party at a stopover, almost certainly in Salisbury. 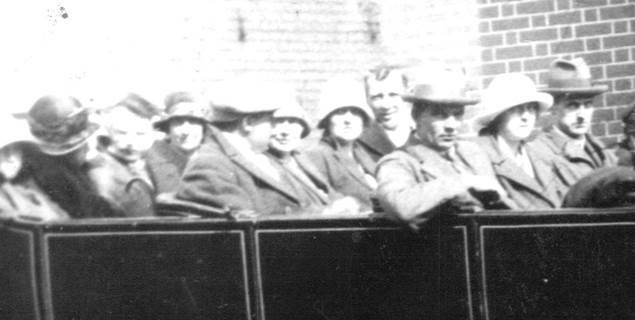 A charabanc trip in about 1930. Probably a football outing. A goodly collection of the people on board have been identified and this has allowed the museum to speculate on the nature of this outing. This was the work of former archivist, Priscilla Manley who has suggested this was a football outing for a young team with adult trainers and supporters. Priscilla has sketched the position of heads in the photo and numbered those for whom there are names. This pair are 3 – Albert Potter and 4 – Jim Hurkett who was one of the adults on the trip. We note that they are all wearing buttonhole flowers. This is surely not normal for a football team on their way to a tournament. Could they be going to a wedding? There has been some lovely weather this May and thoughts turn to trips out. 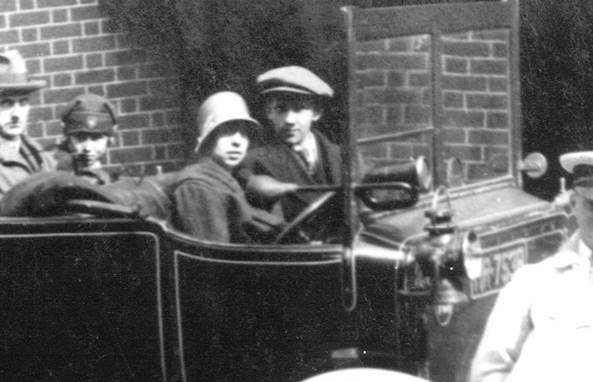 These days we all go off in our private cars, but back in the 20s – 90 years ago – trips were occasional and probably by charabanc. 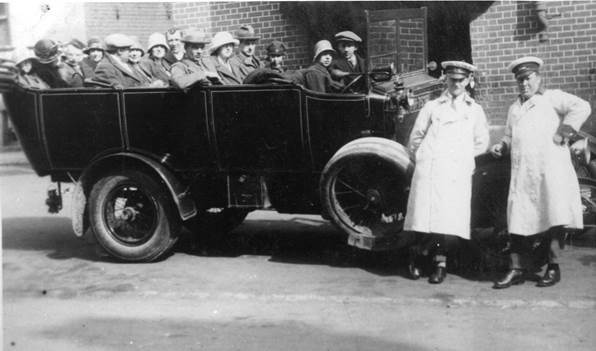 And here we have yet another photo of a charabanc outing. It always disappoints the bus enthusiasts that the photographer concentrated on the people. But of course, he was in business to sell the images to the people. He was based in Salisbury and took the photos in the morning as the party headed south to the coast. Prints were ready for people to buy when the returning merrymakers stopped off for a break on their way home. A few names are given on the back of this card. 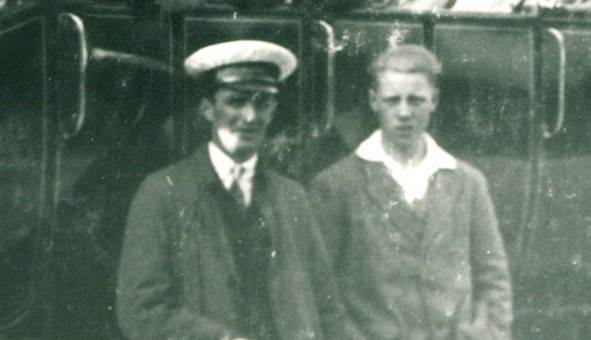 The driver, Percy Notton and the man thought to be Bill Hobbs are easy to identify. George Pike must be one of the most photographed of Lavington people so he can be picked out and we think his wife is with him. We are not sure which man is Joe Compton. Let’s just enlarge some other people, in case they can be recognised. Can you identify any of these people? Yes, we have many charabanc photos at Market Lavington Museum. This one doesn’t have enough information to let us know the location. Such photos were often taken in Salisbury. We believe this photo was taken in Wiltshire’s cathedral city. The year given is 1923. We now think it may have been a few years later. The information we have is that the driver was ‘Tubby’ Cooper. There look to be two crew members by the bus. It is only a guess that the rather more portly gentleman on the right is ‘Tubby’. 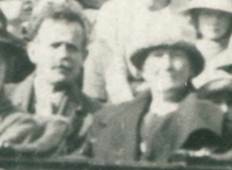 Our information also tells us that passengers on the bus include Mr and Mrs Harry King Junior. Again we can only guess that they might be the couple sitting in the front row. But Henry King Junior was born in 1905. It is possible, but unlikely that he was married by 1923. Oh for better annotation! Is this couple Mr and Mrs Harry King junior? Maybe other passengers can be recognised as well. Do let us know. 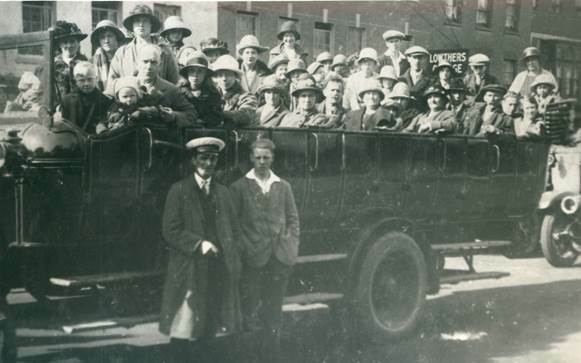 Today we look at another of the many charabanc photos we have at Market Lavington Museum. 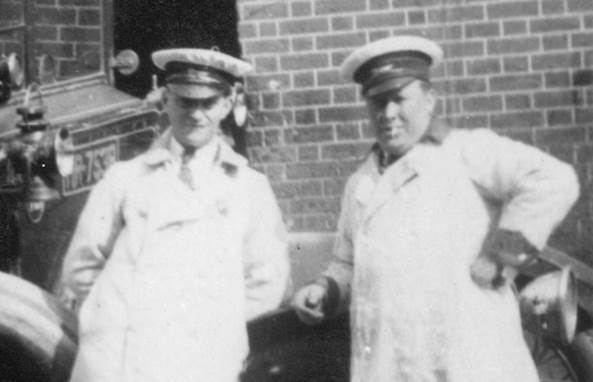 Fred Sayer had a substantial fleet of vehicles, based in Market Lavington and he ran trips to all sorts of tourist destinations during the 1920s. If trips were heading to the seaside they were almost bound to pass through Salisbury where a ‘comfort break’ was made. An enterprising photographer took photos of the party on the outward journey and had prints for sale on the return. So, as per usual, the location is Salisbury but certainly quite a few of the people come from Lavington. 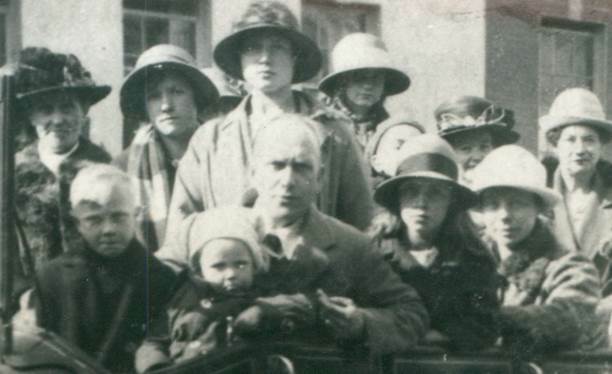 The driver, in white coat and cap is Percy Notton and amongst those on the vehicle we have Ivy Pomeroy, Jack Plank, W Trotter senior, Harry Merritt, Mrs Gye and baby Tom Gye and also Mrs Ross and her son. Standing by the bus we have Joe Gye and Charles Ross. The charabanc is a Commer Car and has a registration, partly hidden by the starting handle of A? 9868. The photo can be dated by the age of Tom Gye, the baby, to about 1922 or 23. As ever, any tales about these people, or identities of others in the photo would be very welcome.